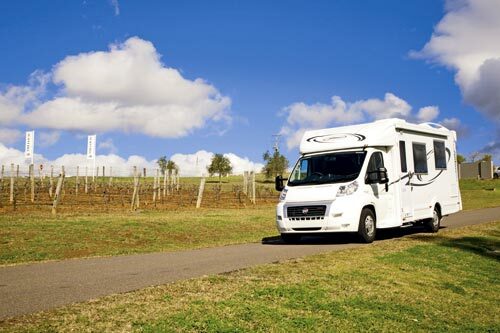 Although it’s not Australia’s largest motorhome manufacturer, Victoria-based Sunliner Motorhomes makes a wide range of motorhomes, from budget-level van conversions to the exotic Monte Carlos. 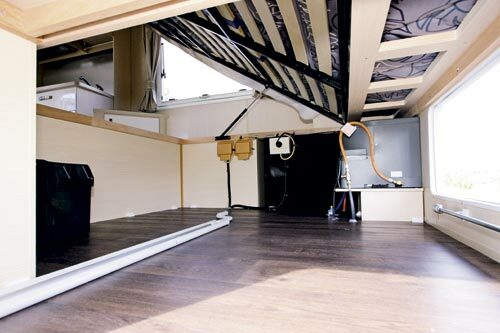 The budget Vida range is available in several layouts, in a large Fiat Ducato van conversion or as a B class motorhome with either a Fiat Ducato or Ford Transit base vehicle. 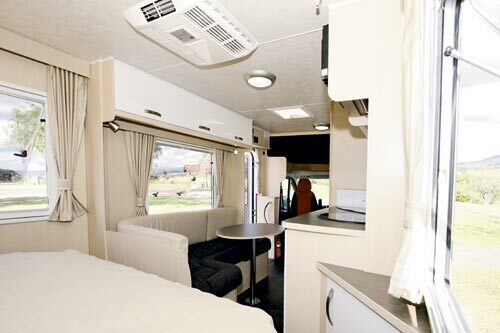 My review Vida came from Australian Motor Homes (AMH) in Newcastle, NSW, and Sunliner expert Bert Van Leeuwarden gave me the rundown. 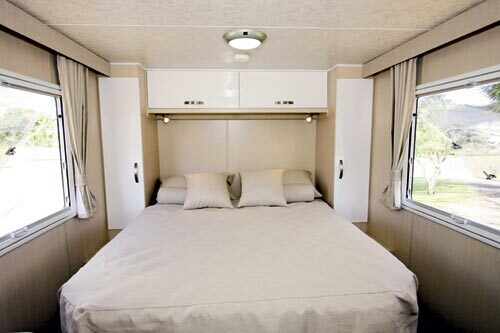 In order to keep my champagne expectations in check, Bert was quick to point out that the Vida was built to a budget, rather than a specification list, and that it was designed with a caravan layout in mind. This particular Vida has a Fiat Ducato Multijet 180 cab chassis and is a B class unit, so it doesn’t have a Luton peak sleeping compartment above the driver’s cab. It comes with Fiat’s most powerful engine, the 3L turbodiesel which puts out 132kW of power and 400Nm of torque, with a six-speed automated gearbox. Above the chassis, the Vida has the same Sunliner body style as its stablemates. Like several other manufacturers, Sunliner is a bit coy in its brochures about the body structure, but it mostly consists of ‘Thermotough’ composite fibreglass walls and moulded fibreglass front and rear with a handy side-step under the cab doors. That might sound a little odd but, along with the moulded Luton and the rakish Fiat Ducato, it dilutes the boxy look quite considerably. There are large, tinted Seitz windows and the entry door with a top half windows and full security screen is hinged on the forward side, so that is does not interfere with the adjoining window. External storage can be an issue with low-bodied Ducatos but, in this case, Sunliner has made full use of the under-bed area with bin doors on both the rear-nearside and the rear wall. You might wonder what to do with water and drainage hoses but the large plastic bin should solve that problem. The gas cylinder bin, complete with two 4kg bottles, takes up some space in the offside area under the bed. The Vida tootles along very well on the road. The Ducato is certainly not carrying an excessive weight, with a load capacity just over 1000kg, and the torquey motor delivers when needed. One of the things I really like about the Fiat, especially in a rig that is only 7.4m (24ft 3in) long, is its very easy handling characteristics. In addition to the excellent external rear view mirrors, the rear view camera, fitted where the internal mirror is normally mounted, makes reverse parking a breeze. Setting up the Vida, once parked, is quite easy. Lower the rear corner stabilisers (a Sunliner feature), wind out the Prostor awning and you’re done. Inside, it’s a matter of swivelling both cab seats – Fiat’s are the easiest in the business – and opening the windows. Sunliner has placed the electrical control panel above the entry door, so it’s quite handy for turning things on and off as you come and go. 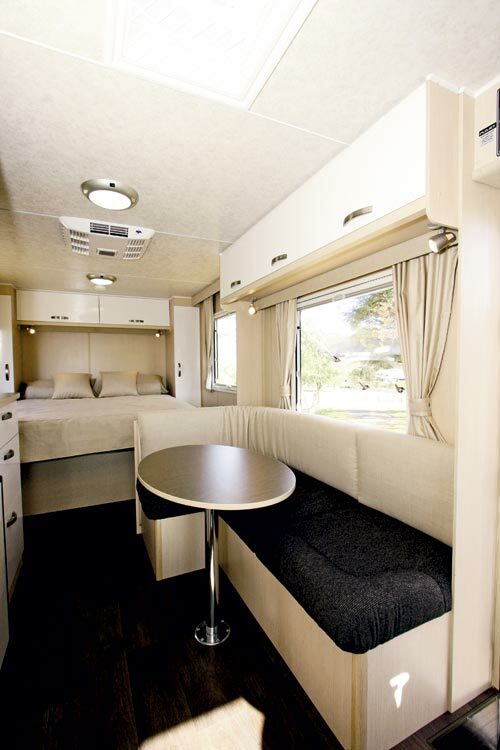 The standout item of the Vida’s interior is the rear island bed, which the rest of the layout fits around. There is a nearside dinette between the bed and the entry door, offside kitchen and offside bathroom cubicle behind the driver’s seat. 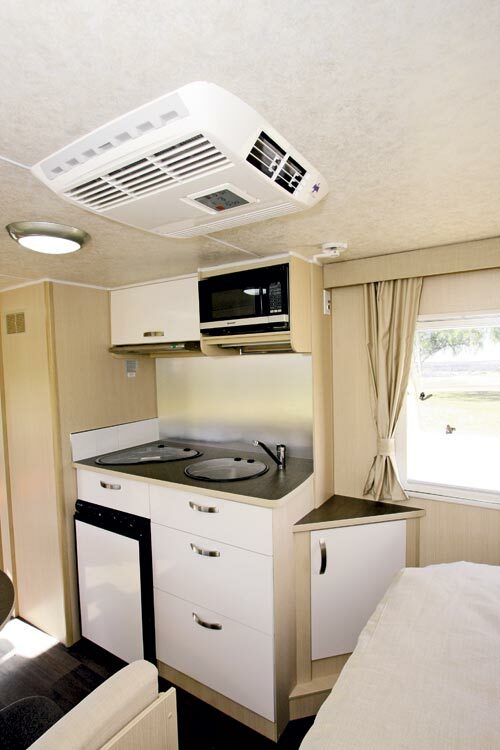 Being the budget model, the general décor is a little bit bland compared to the usual Sunliner style. And instead of contemporary LED light fittings, the Vida takes a step back in energy efficiency with overhead fluorescents and halogen reading lights. But it’s all still very functional. One great feature of the rear island bed is that, while it is more than 1.83m (6ft) long, there’s still plenty of walk-around space. Some beds, when extended with the bolster, leave no space around the edge, but this one does. Fresh air and natural light are assured by large windows on either side of the bed. 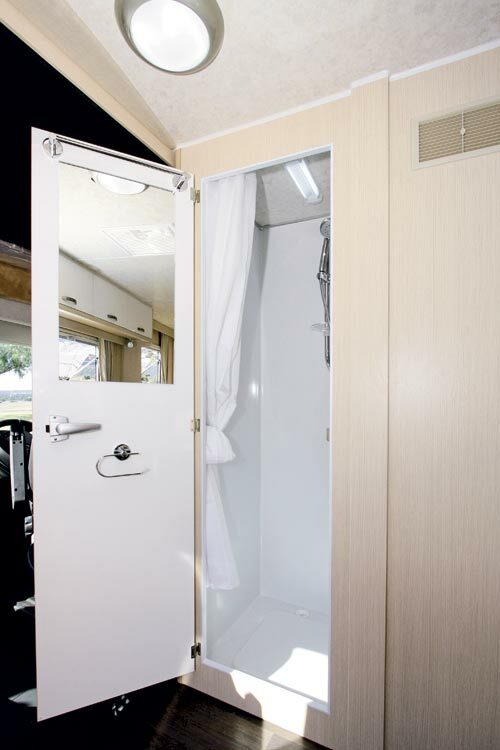 And it comes with a bedhead of overhead lockers, side wardrobes and bedside cabinets. The wardrobes can have either hanging space or removable shelves. Lifting the posture-slat bed base gives access to the spacious area underneath, which is also accessible from the outside. Although the 100Ah battery and Truma hot water heater (and aforementioned gas bottles) are located under the bed, there is still room for all the necessities. 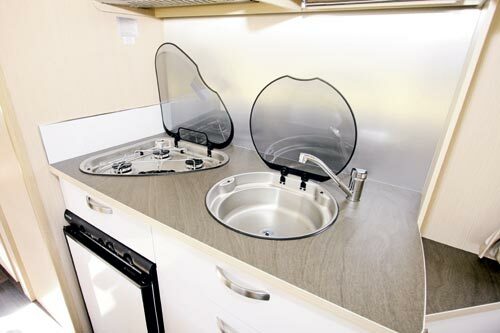 The kitchen may seem small to some – but it depends very much on how you travel. It comes with a three-burner cooktop sans grill, and a stainless steel sink sans drainer but the 93L under-bench three-way fridge isn’t designed for extended remote stays. Given the fridge’s location, it’s a bit of a moot point about whether it is hinged on the right or left. This one is hinged on the right which, for me, is the wrong side but it means the door can be opened almost a full 180 degrees. Sunliner has wisely opted for drawers to maximise the useful storage space but there’s only one overhead locker, with the adjoining space occupied by the microwave. to gain access. A couple of budget floor locker doors wouldn’t go astray. 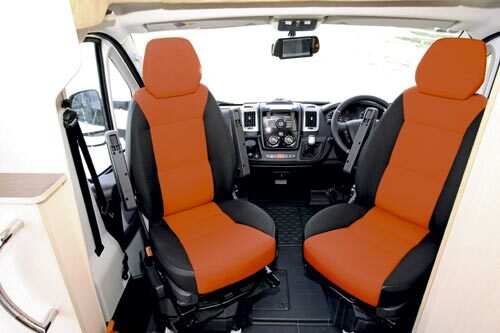 Up the front, both cab seats swivel around and, although the bathroom blocks the driver’s one slightly, these are an excellent alternative to the dinette for just sitting back and relaxing. But watching the optional TV might be tricky – the antenna connection by the entry door would need a long swivel arm to be useful. There are no surprises in the compact combo bathroom. 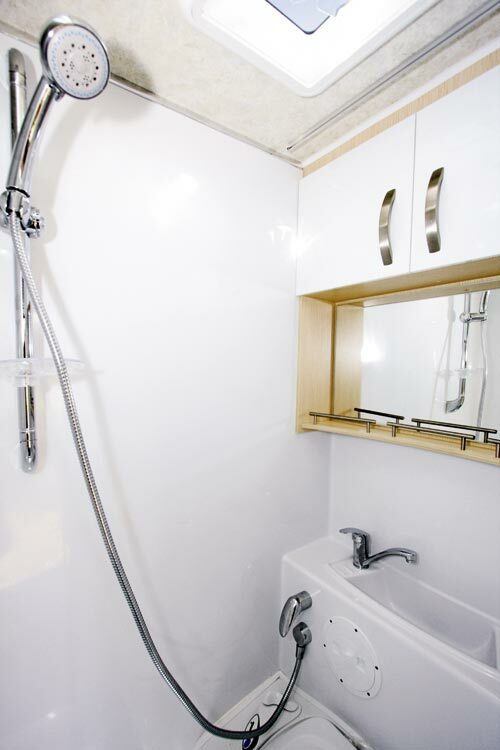 It has a variable-height flexible shower, Thetford cassette toilet, small washbasin, shaving cabinet and separate wall mirror. My only minor quibble is that you have to lean over the loo to get to the washbasin. The door is also used for a towel rail holder, loo roll holder and mirror. 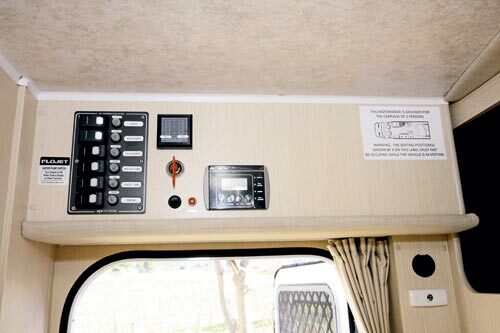 Like any motorhome, this one has its compromises – such as the relatively-small kitchen – but it also has assets like the large bedroom and reasonably-sized bathroom. So, taking all that into account, it should appeal to a good range of motorhomers. 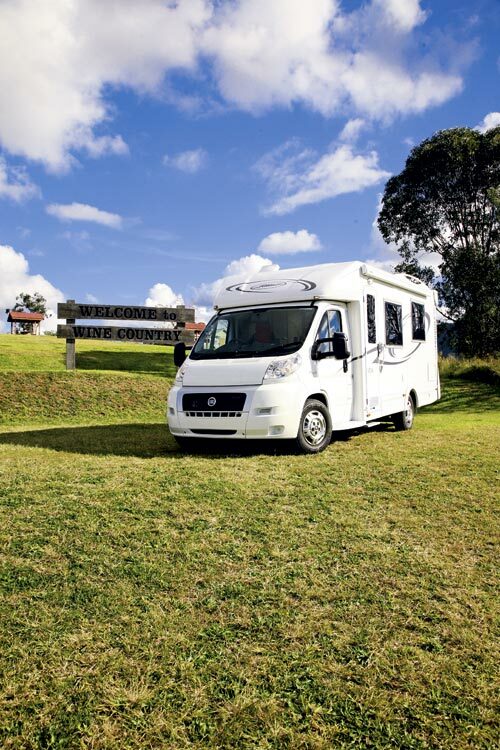 The Vida comes with a number of (although not all) Sunliner features that we have come to expect and being built on a Fiat Ducato chassis means it is a comfortable touring motorhome. 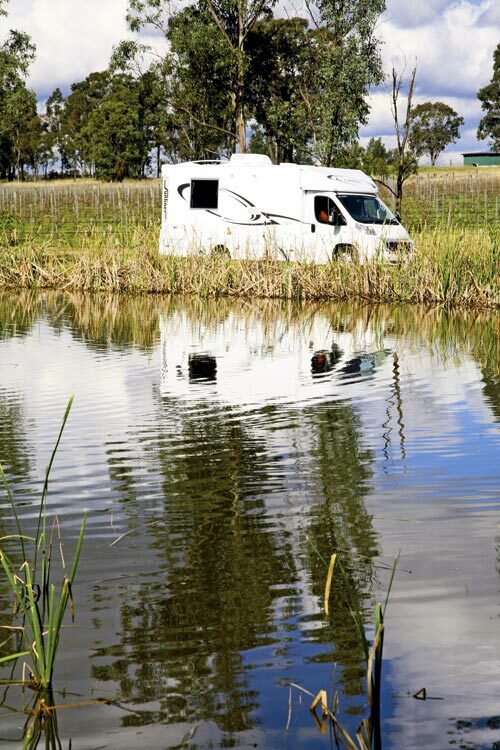 The Fiat Ducato is very motorhome-friendly, from both the manufacturer’s and user’s points of view. It arrives from the Fiat factory with the cab back already removed, swivel seats installed and a wider chassis than the usual commercial one, which gives a better ride and more interior space. Although not used with the Vida, the front-wheel drive Ducato is also available as just a cab (for delivery, two cabs are bolted back to back) to which a higher weight rated Al-Ko chassis can be attached. That has the option of either single or twin axles. 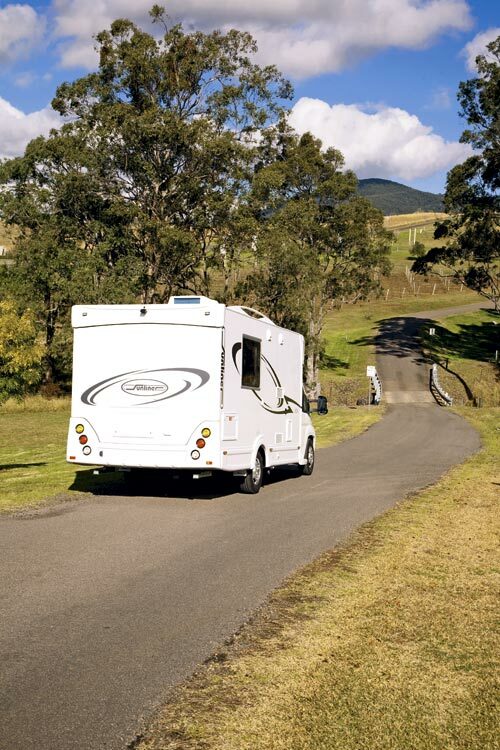 Although most motorhome manufacturers use the larger 3L turbodiesel engine, the slightly less-powerful 2.3L 109kW/350Nm is also available. 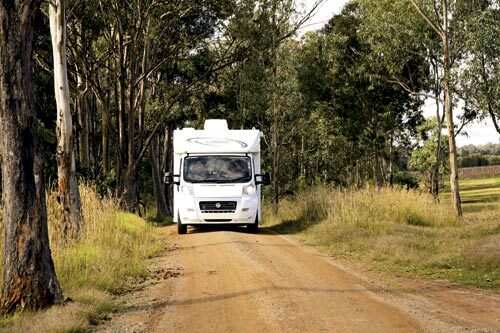 As I noted elsewhere, the six-speed automated manual transmission (AMT) gearbox is usually fitted to most motorhomes but a manual gearbox is also available. The AMT is reasonably smooth but, oddly enough, seems to be smoothest with heavier motorhomes!